Wouldn’t you love it if people could search for your products in Google and buy them right then and there? As a searcher, wouldn’t it be convenient to skip a few steps in the purchase process by buying products directly from search results? That’s why Google has been working on a “Buy” button for search ads since late-2014. If you’re not familiar with it, or haven’t seen it in the wild, that’s because the final product still hasn’t been released. However, that certainly doesn’t mean you shouldn’t learn as much as you can about it ahead of the official launch. Brushing up on the latest information will help you stay ahead of the competition. When they’re fumbling around trying to figure out what to do with the “Buy” button, you’ll be equipped with the all the must-know details. In this explainer post, we’re going to start from the very beginning. We’ll explain what the “Buy” button is, how merchants can benefit from it, and go over some news items illustrating Google’s plans for the eventual roll out. 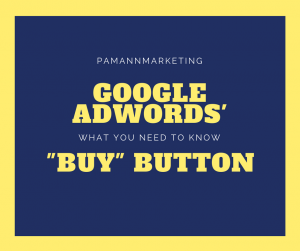 What is the Google AdWords “Buy” Button? News broke in late-2014 that Google was working on a “Buy” button, which would be embedded into search results. The company said this solution was designed to help make it easier for people to shop from their mobile devices. The news was also reported by the Wall Street Journal as a move by Google to take on e-commerce giant Amazon with an e-commerce solution of its own. Although there would be one glaring difference between the two companies. Amazon has its own warehouses, while Google would be relying solely on third-party retailers to fulfill the orders. On the other hand that’s great news for retailers since Google will be helping rather than competing with them. Whether that would end up being a hindrance to Google’s e-commerce efforts would remain to be seen, as the product was a long way off from launching in 2014. It wasn’t until the summer of 2015 that we learned more about Google’s “Buy” button. Google gave the new feature a name, “Purchases on Google,” and explained more about how it will work. We’ll go over more about that in the next section. How Does Google’s “Buy” Button Work? Purchases on Google was rolled out as a test in 2015, which allowed merchants to include a “Buy on Google” button in their product ads. After tapping on the button, customers would be taken to a Google-hosted sales page where they could instantly check out with stored credit card information. According to Google, retailers opting into Purchases on Google can expect to see improved mobile conversions due to the simplified checkout process. Retailers only pay for clicks to the product page itself, all clicks within the product page are free. While Google hosts the product page, the retailer still has control over the look of the page which gives them the opportunity to insert their own branding. Retailers also own the back and forth communication between customers. When Purchases on Google was first rolled out it was an early experiment with a limited number of retailers — but Google had high hopes for it. Let’s forget for a second that Purchases on Google is still available in a limited beta test, and most of us couldn’t use the “Buy” button even if we wanted to. Hypothetically — what are the pros and cons of using the “Buy” button when the option becomes available to everyone? Among the first pro that comes to mind is the potential for higher conversion rates. Google itself has emphasized greater conversions as one of the selling points of opting-in to Purchases on Google. The idea of being able to buy products directly from the search engine results pages immediately conjures up the image of more people shopping with their mobile device. Another benefit may be the potential to acquire new customers who may not have heard of your business. Comparison shopping is remarkably easy Using Google’s Product Ads. If a customer’s favorite retailer doesn’t have the “Buy” button on their ads but you do — it may just be you getting the sale instead. There’s one more major benefit to using the “Buy” button which is difficult to quantify in numbers, and that is customer satisfaction. If you can provide a seamless and frictionless buying experience the first time, the customer may be more likely to click on your ad the next time because they know they’ll be happy with the experience. Using Google’s “Buy” button is a trade-off between conversions and traffic. On one hand, you could potentially increase conversions with this new tool. On the other hand, you’ll be driving customers to off-site sales pages. That means you’re not getting any of the traffic generated from the “Buy” button. Google says merchants will have the opportunity to customize their Google-hosted landing pages to a certain extent, but it’s still not the same as driving traffic to your own website. Another potential drawback of using the “Buy” button is that it’s new and unproven. It may take time for customers to get comfortable with unfamiliar landing pages and making purchases with credit card information stored in their Google account. In theory, a “Buy” button sounds like a sure win for more sales. Then you have to consider people’s natural resistance to change and how it may actually detract from sales until they become more familiar with it. It’s still uncertain how people will respond to Google’s “Buy” button after a mass rollout because the final product is still yet to be released. To catch up on the latest regarding Purchases on Google and how far along the program currently is, please see the next section which recaps the top headlines. In December 2014, the Wall Street Journal reported Google is working on a “Buy” button. This was the first time the digital marketing world heard about Google’s intriguing new AdWords feature. In May 2016, the Wall Street Journal once again reported Google was getting ready to test out its “Buy” button. This was also when we learned it would be available in paid listings in mobile search only. More details about how the feature would work was also revealed, but Google still hadn’t officially commented on it. In July 2015, Google finally and officially announced the Purchases on Google program. The company explained how the “Buy” button would work, which ended up being spot on with what the Wall Street Journal reported months earlier. Here we are in May 2017, and news about Google’s “Buy” Button has been scarce. Though the company is still working on it, there’s no doubt about that. Inc recently reported more advertisers are starting to see the option to opt-in to Purchases on Google via the Merchant Center. This appears to be available on an invite-only basis right now, and it’s not clear who is being invited to participate. It was also recently learned that the “Buy” button will only show up in search results for those shopping on an Android phone. Nearly 3 years since the initial announcement and the “Buy” button is still extremely limited both in who can use it and who can see it. Now you’re up to date with everything you need to know about Google’s “Buy” button. As you can see Google is a long way off from becoming the next Amazon, but the fledgling feature is still worth keeping an eye on. Being able to buy products from Google search results has the potential to disrupt e-commerce in a huge way. 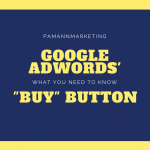 For more information about the Google “Buy” button, and everything else Google is working on, stay tuned to our weekly news updates.